Hey there! 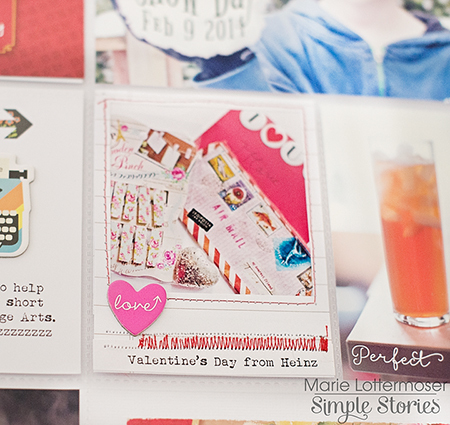 Melissa here, welcome to Day 3 of the Simple Stories & Taylored Expressions Blog Hop Week! We’re so excited to team up with Taylored Expressions to share some inspiring projects with you this week. We’ll be giving away a great Taylored Expressions prize package at the end of the week, so be sure to play along and check back on Sunday the 30th to see if you’re the lucky winner! Taylored Expressions is also posting projects and giving away prizes, so be sure to check out their blog and Facebook page, too! I've been steadily working through a backlog of photos that I need to edit from the end of 2013, which makes now the perfect time to finish up the remaining half dozen or so weeks in my 2011 album. I love skipping around while scrapping my weeks since it gives me lots of freedom when matching products to photos, and for this particular week I went with the A Charmed Life collection- along with some fantastic Taylored Expressions dies, of course! My birthday is on St. Patrick's Day, so of course my first inclination is to use A Charmed Life to scrapbook photos from that event (and, honestly, I probably will be using it for that, too! ), but I'm also a big fan of using collections for something other than their theme suggests. During this particular week in 2011 I was participating in Ali Edwards' Week in the Life project, so I had lots of great photos that reminded me of everything I love about my life and our home. "A Charmed Life" seemed to be the perfect sentiment to go along with them! The two sets of Taylored Expressions dies that I used on this page were the inspiration for my title card for this week. The 3x4 Photo Frame from their Pockets and Pages collection was the exact size that I needed to frame up a 3x3 Insta-Square card, and the Label It die cuts make adorable banner strips (and a perfect parking spot for my dates!). I used the Label It dies in several places on my layout as a grounding element for stickers and embellishments, helping to bring a bit more color and remove the "floating" aspect that can sometimes happen on my mages. I've also put together a short video showing how this layout came together from start to finish! Simple Stories' 12x12 SN@P faux leather albums in aqua are the perfect place to hold my layouts when they're finished, and for 2011-2013 I've stuck to Design 3 Pocket Pages to make things easy. I've pretty much got making layouts in them down to a science now! Head on over to the Taylored Expressions blog and check out what their Design Team has created using their stamps & dies and our Simple Stories products! They’re also hosting giveaways as well, so what are you waiting for – head on over! Check in again with us tomorrow for more inspiring projects from Simple Stories & Taylored Expressions! Hey there! 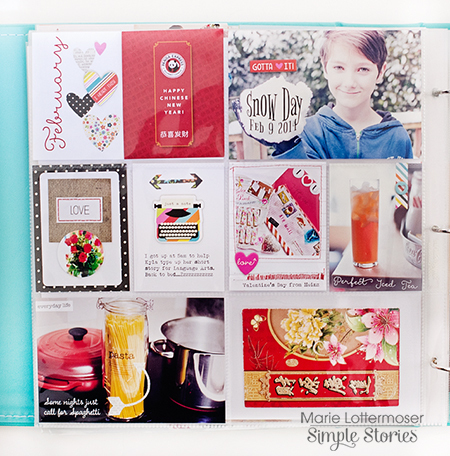 Vicki here, welcome to Day 2 of the Simple Stories & Taylored Expressions Blog Hop Week! We’re so excited to team up with Taylored Expressions to share some inspiring projects with you this week. I used the solid sides of the patterned paper from DIY Boutique to cut the die words out. I found the words much easier to read with the solid patterns. I have to say these dies work like magic!! The cuts were super clean and detailed. They released easily from the dies even though they are delicate. I hope you can see how clean the cuts are in this image!! To finish off the words, I simple punched 2" circles from solids again and layered them. The DIY stickers were the perfect compliment to the dies. I have always been a fan of die cuts and I love that many of the Taylored Expressions dies also come with matching stamps! I will be checking out more of their products...these circles have me hooked!!! Hi all! Teri here, welcome to Day 1of the Simple Stories & Taylored Expressions Blog Hop Week! We’re so excited to team up with Taylored Expressions to share some inspiring projects with you this week. Today I'm excited to share with you a couple pages I made with the A Charmed Life collection and some fabulous steel dies from Taylored Expressions. My approach to my Life Documented pages is fairly liberal. While many of my friends follow a strict schedule and put together pages every week, I tend to focus on events and only document things when I feel like it. Sometimes I have lots to document and sometimes I don't. So this spread really focuses on two fun things that happened this month. First, I took part in a St. Patrick's Day run/walk. Second, a couple of my neighbors created some fantastic chalk drawings and just had to share them with me! The first page is all about the run/walk. Let's be honest: I am the slowest runner ever. The cellar position in the final standings whenever I take part in a race is usually occupied by me. That's OK. I still totally love taking part in these runs. And this one, especially, was fun because it had a St. Patrick's Day theme. Almost everyone wore green or something Irish-inspired for it! 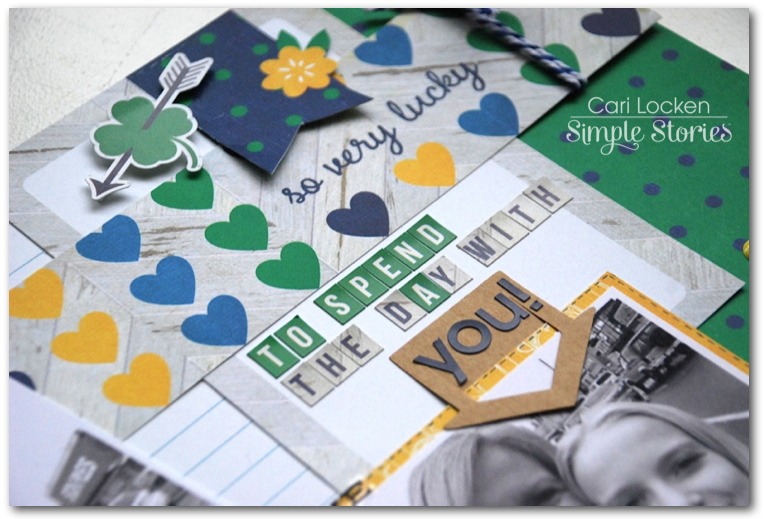 With lots of green, a few clovers and an abundance of words like "lucky" and "happy" showing up in the A Charmed Life collection, I felt it was perfect for this project. Two of my favorite elements on this page are the Super Happy and It Was cards. The Super Happy card started out as a regular old SN@P! Cut card. I added the decorative Chevron elements over the Happy word with a die from Taylored Expressions' Pockets & Pages Essentials - 2x2 dies. I love the look! I created the card next it by die-cutting a piece of vellum with Taylored Expressions' Pockets & Pages - 3x4 Bubble In die and then layering it over some A Charmed Life paper. I sure dig how they look together. I got daring with the picture of my race medal and die-cut it with a square die from the 2x2 dies from Taylored Expressions. I mounted a SN@P! Card in the open space and then slapped some letters onto it, as well as some additional stickers onto the picture. 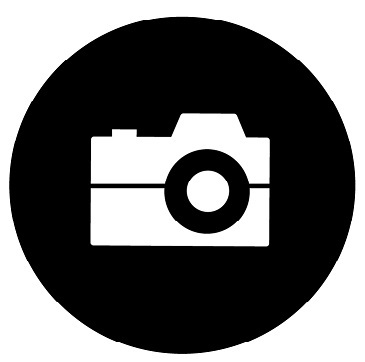 This page focuses on my young neighbors and their artwork! They were so excited to show their chalk art to me that I couldn't resist snapping a few pictures. Believe it or not, they spent two whole days sketching planets, moons and stars onto our street. They were so proud of the results! For the left side of this page, I sliced up a 6x12 A Charmed Life Element into three 4x6 panels. I love how orderly it looks when you do that and then slide the pieces into a Pocket Page. I embellished the bottom panel by adding some additional patterned paper and some die-cut squares. I mounted the star (from A Charmed Life's Bits & Pieces) with foam tape and then added a few brads. By the way, I'm using a 12x12 SN@P! faux leather album in red to document all of my adventures in 2014. I am a huge fan of the album's ring binding because it lets me scrapbook out of order. I used the SN@P! 12x12 Pocket Pages Design 3 and Design 10 for these pages. I love the variety of different page styles of Pocket Pages Simple Stories offers. It's nice to have creative options. We're super excited to introduce Simple Inspiration eBooks - free, downloadable idea books. Beginning with our most recent releases, you can now look forward to an eBook with each of our new collections! Today brings you the second of our new eBooks - the A Charmed Life Simple Inspiration eBook - 16 pages of amazing inspiration; simply click on the link below to download & enjoy! If you missed our Homespun Simple Inspiration eBook, you can download it here! To see more projects using our A Charmed Life Collection, visit our A Charmed Life Pinterest board here! Nichol here today showcasing the A Charmed Life Collection with a new layout and card featuring combining the Simple Stories Silhouette Cut Files for one-of-a-kind titles and greetings. 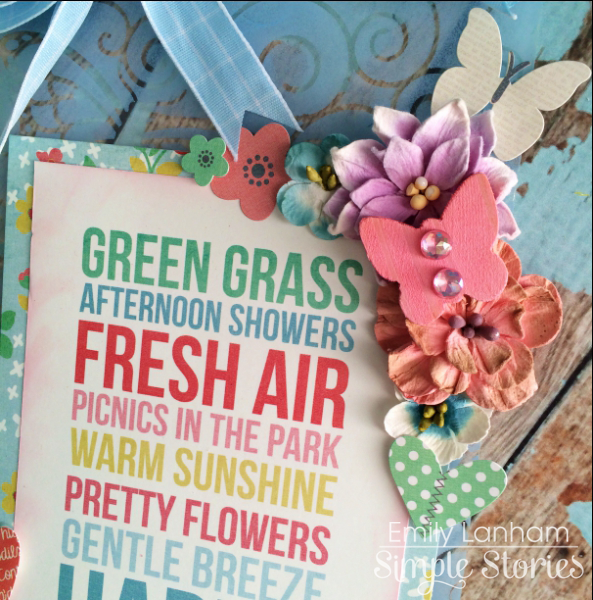 The Simple Stories Silhouette Cut Files are fabulous "as is" however they can make an even bolder statement when grouped together and manipulated a bit to create all new looks! After manipulating and resizing the files in the Silhouette Software, I cut all the text from a single sheet of A Charmed Life 12x12 patterned paper. Then I trimmed and mounted that sheet on another piece of 12x12 paper and "filled in" all the open text by die cutting the words from 6x6 patterned papers from A Charmed Life and I Heart Summer. The assortment of colors and patterns gives the title much more interest and adds lots of color to the page! I used a glue pen adhere the letters without a mess. I layered some of the phrase stickers from A Charmed Life and I Heart Summer on top of the photo strips and "secured" the photo strips to my page with "washi tape" stickers from the Sn@p! Icons Stickers. I printed my journaling directly on the DIY Office Journal Layers and popped it up with a bit of foam adhesive, tucking the cute cloud and sunshine die cut from the Summer Sn@p! Insta-Squares & Pieces. I manipulated the 4 cut files to create my own title. (I used only the letter "I" from the "Can You Believe This?" arrow). I popped up the "Love You" greeting on top of the card and layered a contrasting color of paper underneath the die cut "Always Remember I". By layering papers this way it addds visual interest and dimension to a relatively simple design! I completed the card by adding detail with a white opaque pen, gemstones and adding some sparkle with a clear glitter marker to some of the hearts and adding Glossy Accents to a couple of them as well. 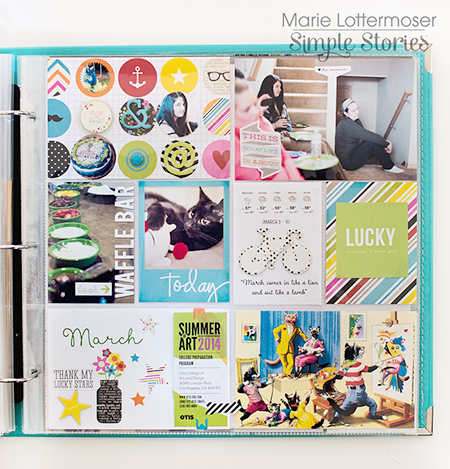 Hi everyone, Marie here today to share a Life Documented project using the new DIY Boutique collection. I've couldn't wait to work with this collection. 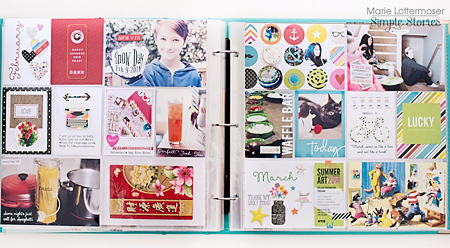 By adding stickers, stamps, and embellishments to foundation cards you can custom make your own elements to put in Pocket Pages. The possibilities are endless! We have been pretty busy with home improvements projects and medical issues the last couple of months, so I didn't have a lot of photos to add to my album. I decided to just use a single page for each month and add in some postcards and ephemera to round things out. If you look at my pages you can see I used more reds and pinks for February and more greens and blues for March. I thought it was a nice way to distinguish between the months, while still using the same collection and keeping the overall look cohesive. In some cases I would add stickers and embellishments right over my photos, and in others I would add them on top of one of the foundation cards. My favorite card to customize was this one full of colorful circles. I added brads, chipboard and circle-punched photos to it. I also customized one of the new Insta-Frames. I slipped a photo of some Valentine presents into the frame, and then stitched around the outside with red thread using my sewing machine. I can see so many options for these frames, such as using them to make little pockets for sequins and other small items. After using the DIY Boutique collection for these pages I can see I've barely scratched the surface of the different ways to use everything. I'll be back next month with even more ways to use this kit. I used 12x12 Pocket Pages in Design 3 | #4050. 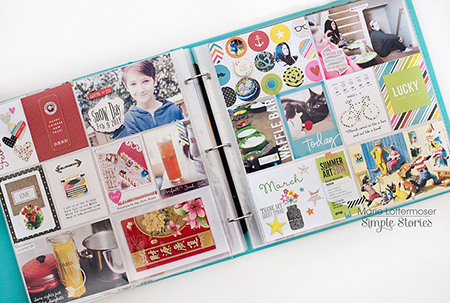 I've been using a 12x12 Faux Leather Album in teal for all of my pages. I've been using this album for quite awhile now and it still looks brand new. The durability is fantastic! New Simple Stories Silhouette Designs Available - Enter to Win! Howdy! Layle here today to share some great news - we have 45 brand new cut file designs, now available for the Silhouette! How about a little incentive to head on over and check out these and our other fun designs here at the Silhouette Online Store?!! Head on over, take a peek at all of our designs, then hop back here and leave a comment on this post telling us which design is your favorite. 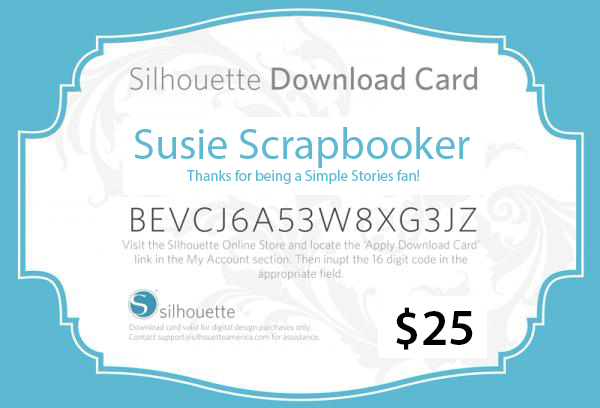 On Monday the 24th, we'll draw one random lucky winner to win a $25 Download Card to the Silhouette Online Store! 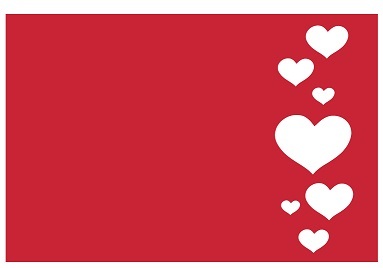 Even better, through March 27th, all designs in the Silhouette store are 50% off! So tell us, which design is your favorite?! Spring is LITERALLY right around the corner, it’s so close we can taste it! With that said, I could not wait to get crafty with the new “Fresh Air” Simple set! I loved this card from the Elements sheet so much that I wanted to base a home décor project around it. After this crazy winter, we all really need something bright & cheery to hang in our homes, right? I made this wall hanging out of some leftover pieces from an acrylic mini album. These are really fun to ink up and then embellish with fun papers & stickers, that’s why the Simple Sets are a must have! They are perfect for any project that you would want to create. I used some of the Fundamentals stickers to add some extra elements to this project. Here’s a look at this lovely décor hanging on my wall. You can really see the difference the acrylic makes here. I had so much fun creating this project to share today. 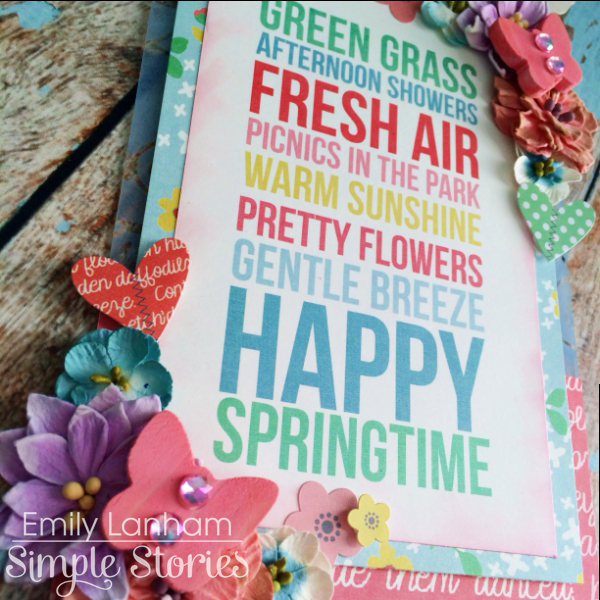 I hope I was able to inspire you to go out and grab some of the new Simple Sets and get creative this Spring! Hello, everyone! Shellye here with a trio of cards featuring just a few of the fun Simple Stories cut files that you can find at Silhouette. My intention was to show varying ideas on how to attach the die cuts, the types of paper to cut them from and fun ways to embellish them! By the way, all files are 50% off at the Silhouette Online Store through the 23rd; now's a great time to pick up these and other Simple Stories designs!! I started with the "awesome" welded word and cut it from both a light grey piece of cardstock and one of the red papers from the 6X6 DIY Boutique Paper Pad. I cut away all but the "so" portion of the red paper and adhered it over the grey wording with foam adhesive. To embellish, I covered a couple of chipboard stars from mystash with papers from the Simple Set. I added the burlap stars and enamel dots from the DIY Do-It-Yourself Collection. So, we have a Father's Day card completed...how about a Mother's Day card? 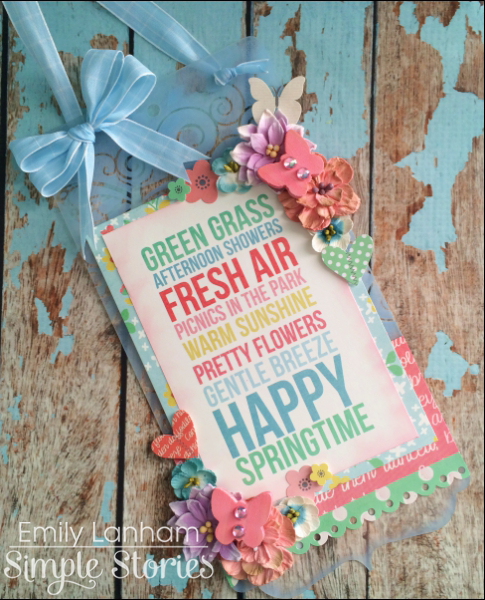 This card features the Hey Mom Simple Set and the "Love You" welded word. After cutting the word from textured cardstock, I backed the opening of the "you" banner with a scrap of paper from the collection. When attaching to the base paper, I placed foam adhesive on the banner part of the die-cut only and then attached the top portion with a quick dry glue. I went on to embellish with pretty trims from May Arts Ribbon and some buttons from my stash. Raspberry colored adhesive pearls hightlight the small hearts at the top of the journal card. Lastly is a play-on-words card that would make a fun belated birthday or forgotten occasion card! 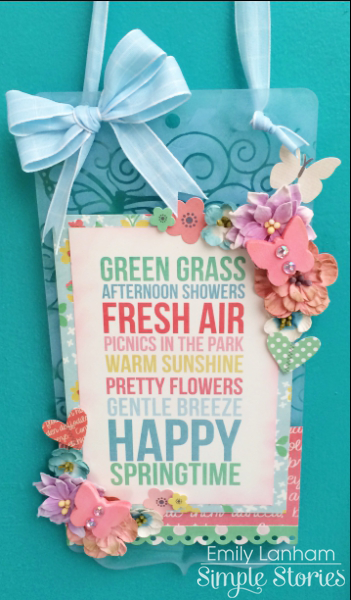 This card is all things cute from the DIY Boutique Collection and this trendy camera cutting file. I cut the shape from the woodgrain paper found in the 6X6 Paper Pad. Turquoise sequins were glued around the opening...I love how they tie in with the background paper! Before adhering to the cardfront, I stitched on a flash using baker's twine. 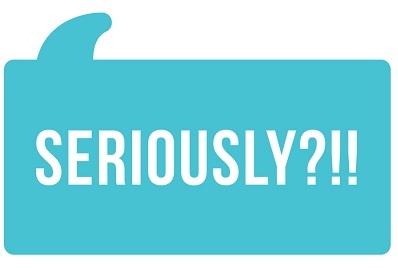 Check out all of the cool Simple Stories Cutting Files at Silhoutte online store! Hello there to all you amazing Simple Stories fans! 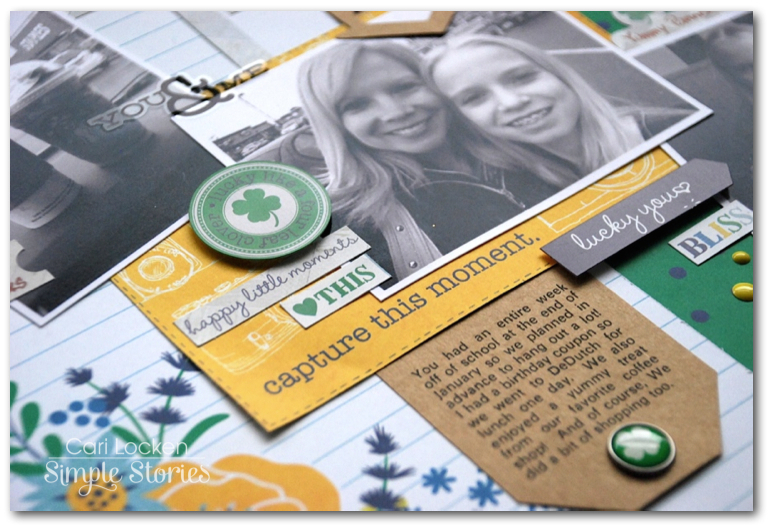 Cari here with you sharing this layout that I created for today in honour of St. Patrick's Day. As you will notice my photos have nothing to do with St. Patty's Day. However, the theme and embellishments of the A Charmed Life collection make this layout still fit so perfectly with today's fun holiday! The colour green, shamrocks and the word 'lucky' is clearly evident everywhere in this collection. This really is a fun collection and I just love how everything matches so wonderfully. I used the 12x12 Expression Cardstock Stickers & Fundamental Cardstock Stickers to create my title and various phrases/words in other places on my layout. You will notice that the 3x4 journal card has a small pennant design along the top edge. I took an x-acto knife and cut out the bottom section of the pennant so that it would overlap onto the 12x 2 title strip. By adding small pieces of foam tape behind some of the stickers which helps to give my layouts some dimension rather than being so 'flat'-looking. I also used some of the DIY Collection. 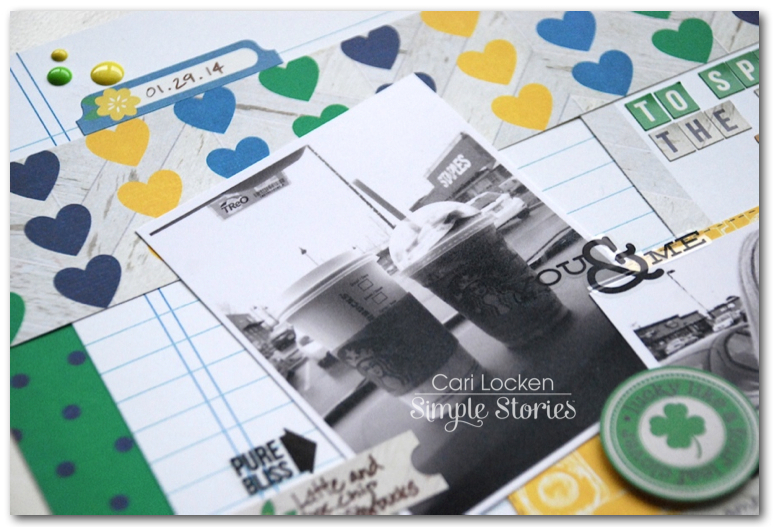 The DIY Clear Stickers (black), DIY Enamel Dots (yellow & green), and DIY Journal Layers (in Kraft). I printed my journaling off on the kraft colored DIY journal tag and adhered a brad from the same collection (A Charmed Life) to give it a final touch. 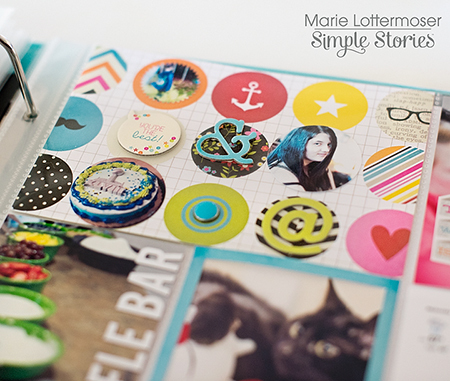 Thanks for stopping by today and I hope that I've inspired you to create with this fabulous Simple Stories collection!